Realistic handwriting fonts generator. Personalised custom handwriting fonts. Our Premium 'Ultra' font service contains over 100 additional characters which adds further realism to your handwriting font. This includes random 'mistakes' and starting and ending flourishes. We make custom, personal, cursive, realistic, 'messy' handwriting fonts from your own handwriting. All you need to do is supply some natural handwriting, and soon you will be able to select your own handwriting in the font menu! Find free realistic, cursive, handwritten fonts and printed handwriting fonts in our handwriting 'Font Vault'. The Font Vault is our repository of free cursive and printed handwriting fonts. These fonts are natural or messy handwriting fonts, and look like real handwriting. Our pre-made and custom handwriting fonts now available to order as single line handwriting fonts (also known as single stroke / open contour fonts) for use with pen plotters and other CAD controlled equipment. You can also order a single-line version of your own custom-made font. 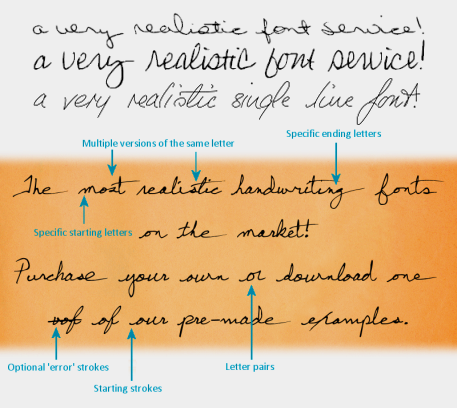 The Best Handwriting Fonts on the Market! No other service comes close for realism and options. Our handwriting fonts are made from real handwriting, with a natural 'messy' appearance. Try over 40 pre-made Premium 'Ultra' realistic handwriting fonts for free in the Scriptalizer™ software, and purchase them for your own personal or commercial use. 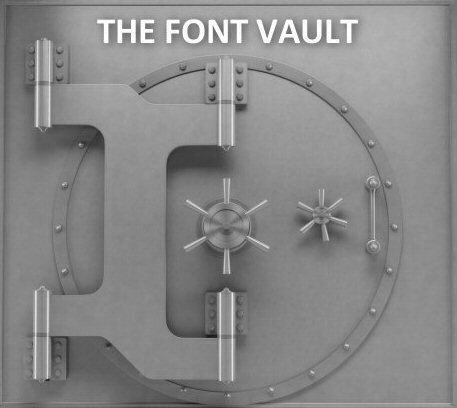 Visit the 'Font Vault' to download free handwriting fonts. 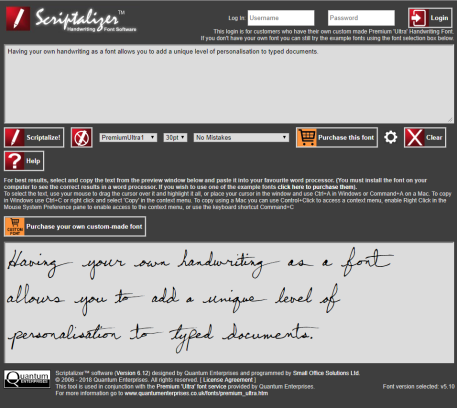 Try our Scriptalizer™ realistic handwriting font generator software for free. Our best service. The Premium 'Ultra' Service produces ultra realistic handwriting fonts, using the Scriptalizer™ software for added realism. Suitable for both printed and cursive (joined up) handwriting and made from your natural handwriting. There's nothing else to compare on the market for quality or price! The Premium 'Ultra' handwriting font service embeds over 100 additional characters in the font, which are accessed and replaced by our FREE Scriptalizer™ Software. The software replaces the 'standard' characters with alternatives on a semi-random basis. The replacements include individual letters, letter pairs, starting letters, ending letters and starting and ending letter strokes. This adds another level of naturalness to your handwriting font. The Premium 'Ultra' service is associated with a unique configuration file which encodes certain aspects of your handwriting style. This gives the fonts the most realistic and natural look you could imagine! The Premium 'Ultra' Service is required to get the best results for cursive (joined up) handwriting, but also significantly improves the realism of printed handwriting styles. This video explains why the Premium 'Ultra' Service and Scriptalizer™ software are the best on the market for producing realistic handwriting fonts. It gives a brief demonstration of the Scriptalizer™ software in action. This video explains the theory of character substitution, and gives a detailed description of how to use the Scriptalizer™ software, including font selection, 'error' characters, and a tour of the software interface. Our best handwriting font service. Ultra realistic handwritten fonts from your natural handwriting, using the Scriptalizer™ software for added realism (for both PC and Mac). The Scriptalizer™ acts as a sort of cursive writing generator- taking an existing handwriting font and making it look more real than ever. Suitable for cursive handwriting (joined up) and printed handwriting. This is the most realistic service on the market because there is more than one version of each letter in your font. 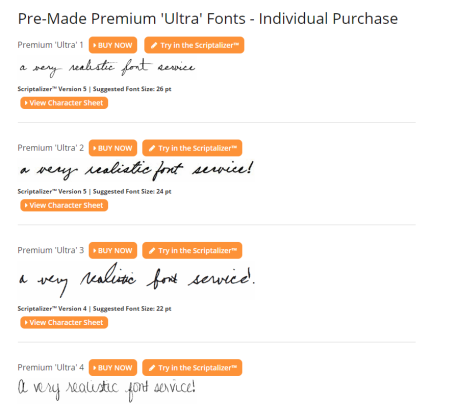 The Premium service is a quality handwriting font service, but does not include the extra characters of the Premium 'Ultra' Service. It produces a realistic custom, cursive or printed handwriting font from your natural handwriting. Suitable for cursive (joined up) and printed handwriting. The SignaTYPE service is a 'signature only' service that produces a font with up to three signatures. 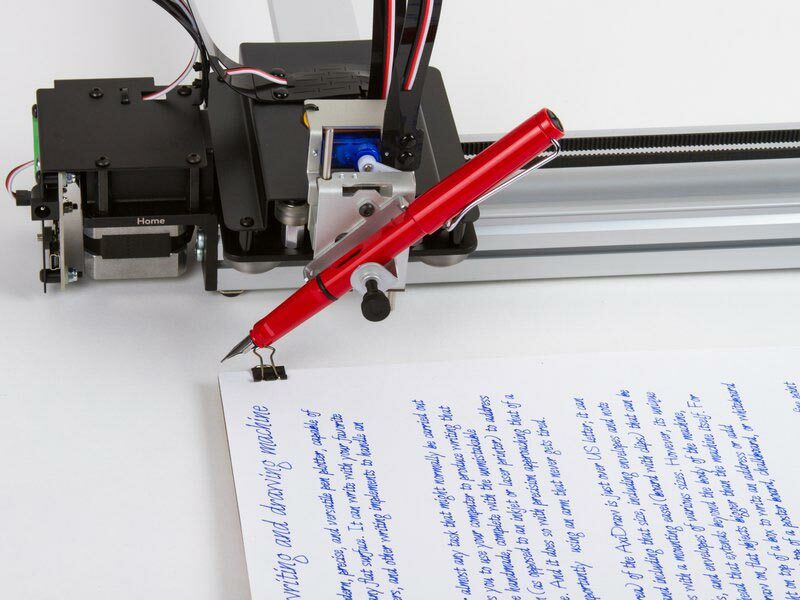 This is ideal if you don't want your whole handwriting turned into a font, but still want to add your signature to documents with a press of a key. Just wanted you to know how blown away I am by my font! Absolutely incredible. Actually, kinda scary, too…it's that accurate! This is absolutely wonderful. Thank-you so much. I suffer from a degenerative spinal disease so quite often I have problems holding a pen, but there are often times when a handwritten note or letter is more appropriate than an email or a word-processed letter. Now I will be able to do that without struggling. Cheers!!! Thank you for the personalised font! This looks amazing. I will be sure to refer my business friends to your excellent service. This is an outstanding service you provide. This is not only an art form, but a science as well. Thank you again. Completely satisfied with your work. I appreciate the amount of time and effort you expended on this project.